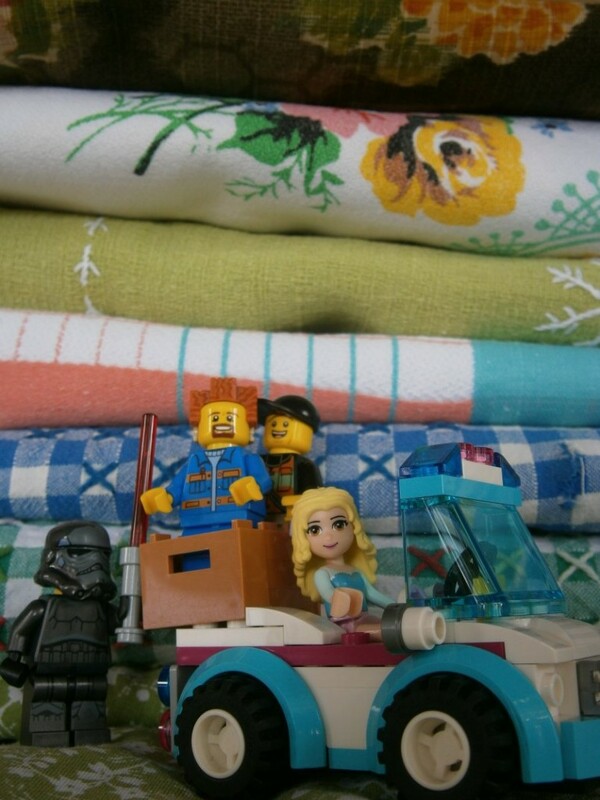 For some time now I’ve been meaning to make a Lego play mat. 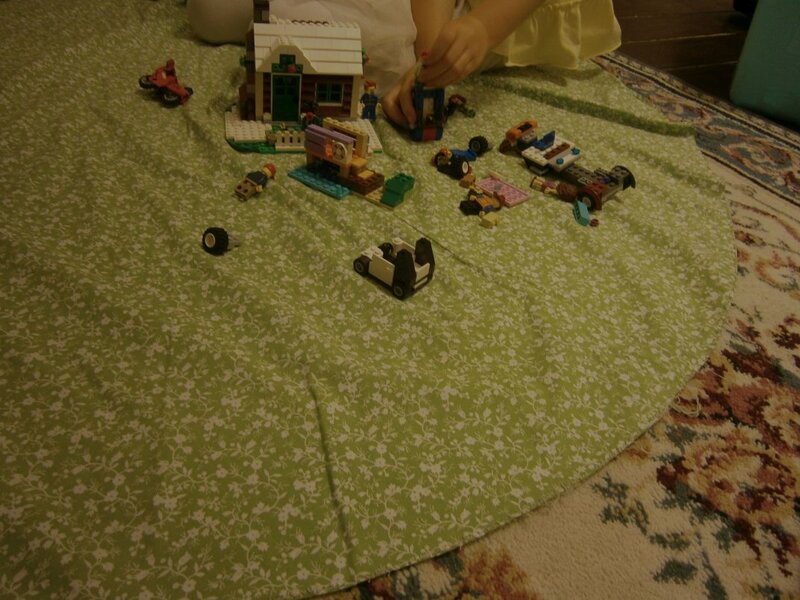 The ideas is you play with Lego sitting on a circle of fabric, then when it’s time to pack up you push the Lego into the middle and the fabric becomes the holder. I had sort of imagined loops of fabric around the edge with a cord, so you could pull the cord up and hang the whole thing on a hook. My husband had one when he was a boy, to store his enviable Lego collection. 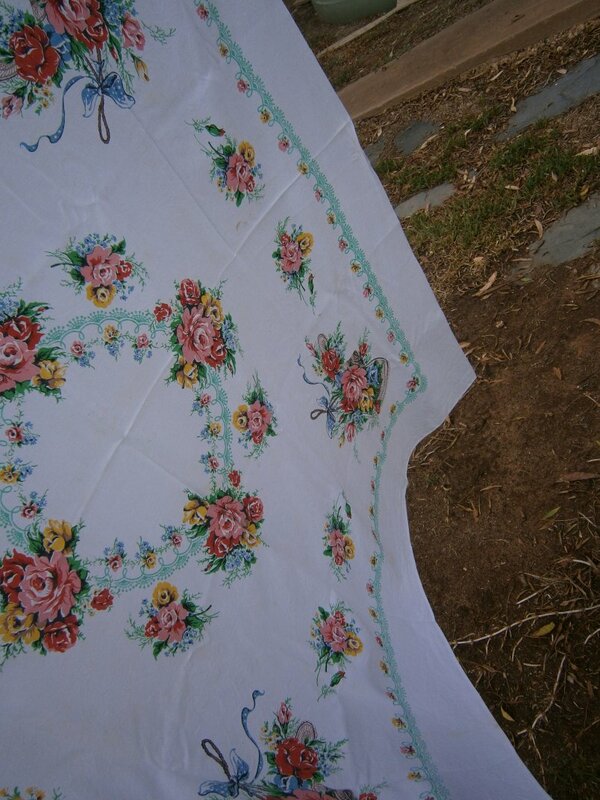 I had intended to use an old table cloth from the op shop, but my plans have been constantly thwarted by beautiful finds. 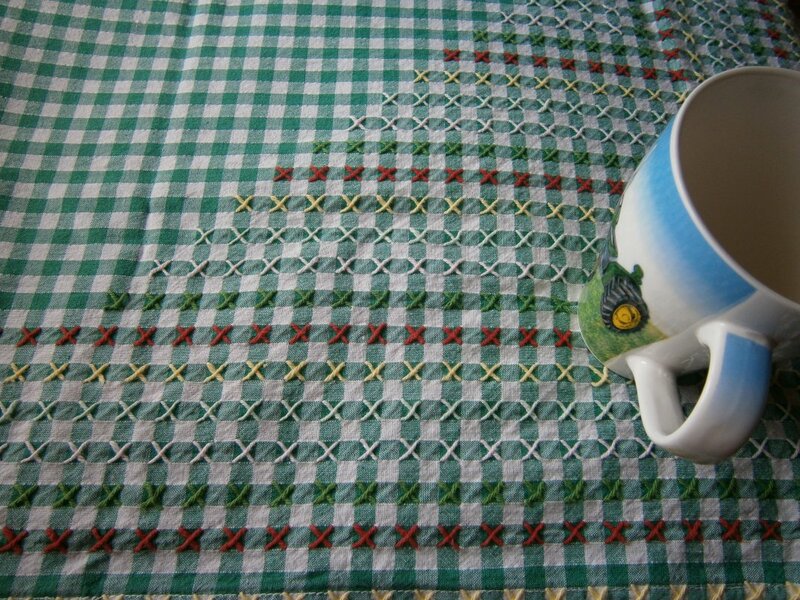 I’ve found seven tablecloths in the past several weeks, but by the time I’ve soaked and washed them, they’ve come up so well that I can’t bear to use them for anything but….tablecloths. 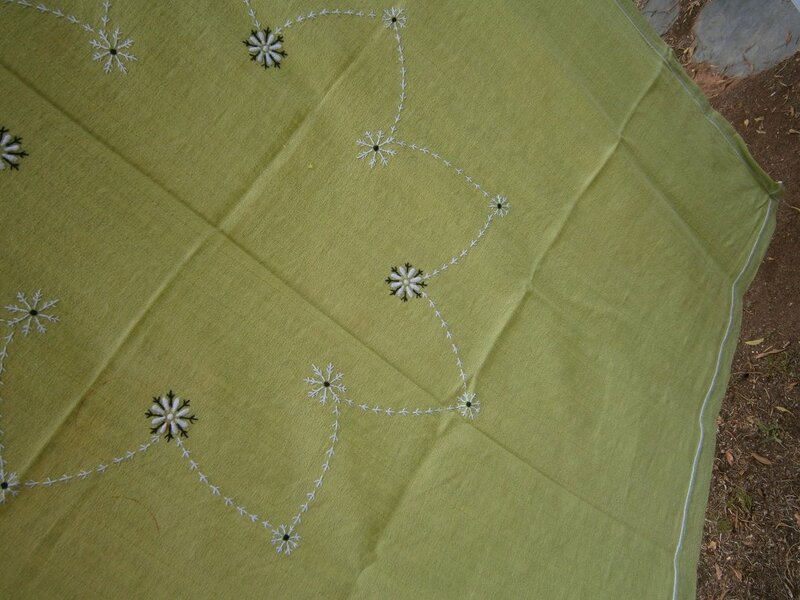 My first buy was this square green tablecloth with a star of flowers embroidered in the centre. 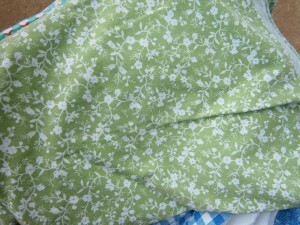 The fabric is textured. 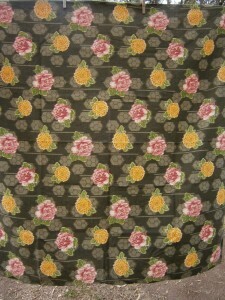 This one has a very pretty printed design that reminds me of Cath Kidston’s retro style. A corner close up. 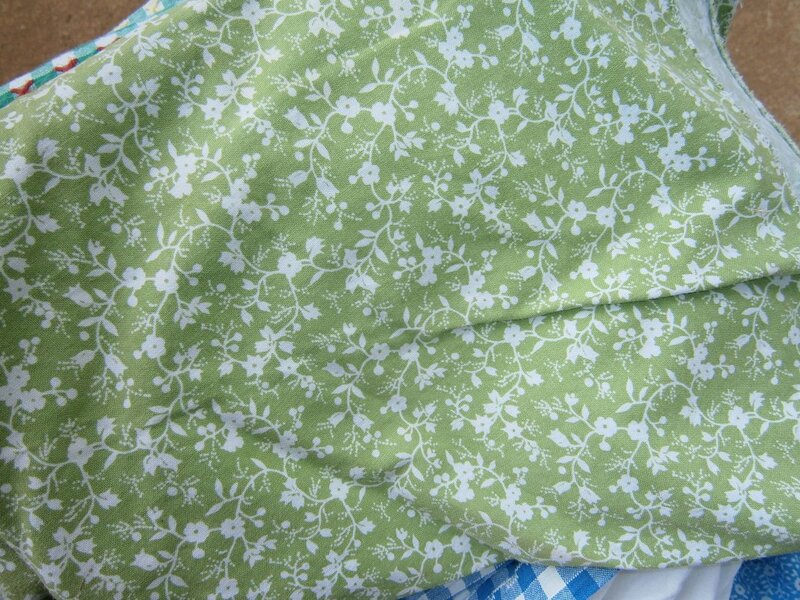 The fabric is sort of crepe-y. 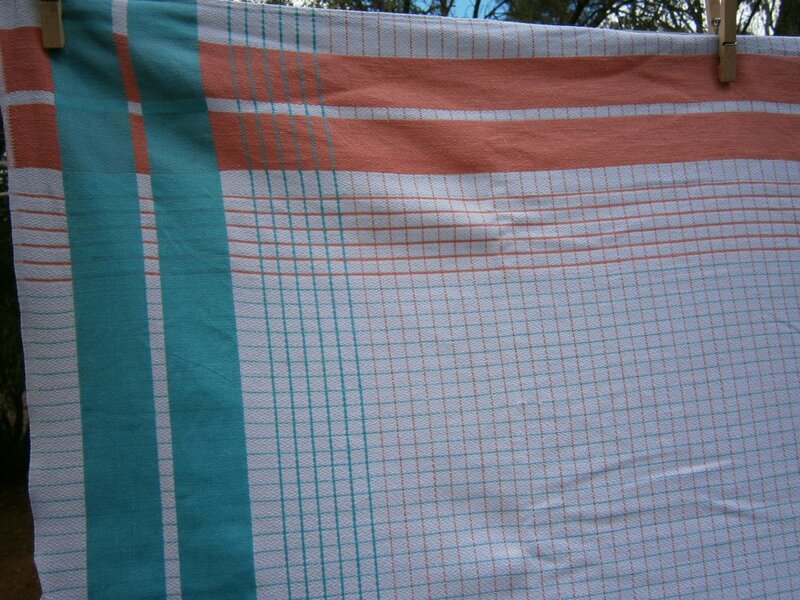 This one was in very bad condition with stains and dirty fold marks, but it came up beautifully after a soak. Mid-century modern? 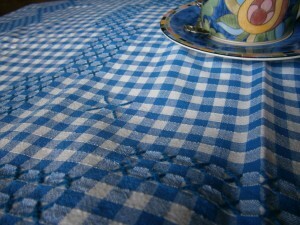 A square blue gingham cloth with cross stitch patterns. The embroidery is so neat it’s hard to tell the right and wrong side. 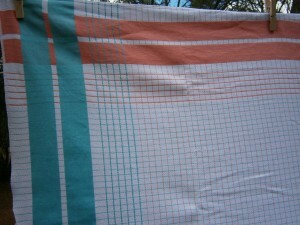 This one was with the blue cloth and I bought them together. It’s a large rectangle. 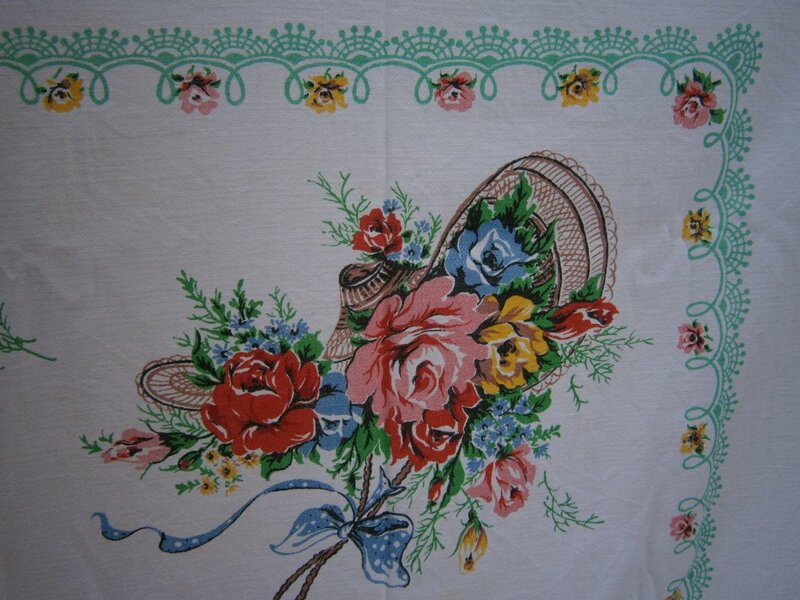 The embroidery is just as neat on this one and I presume they were done by the same person. 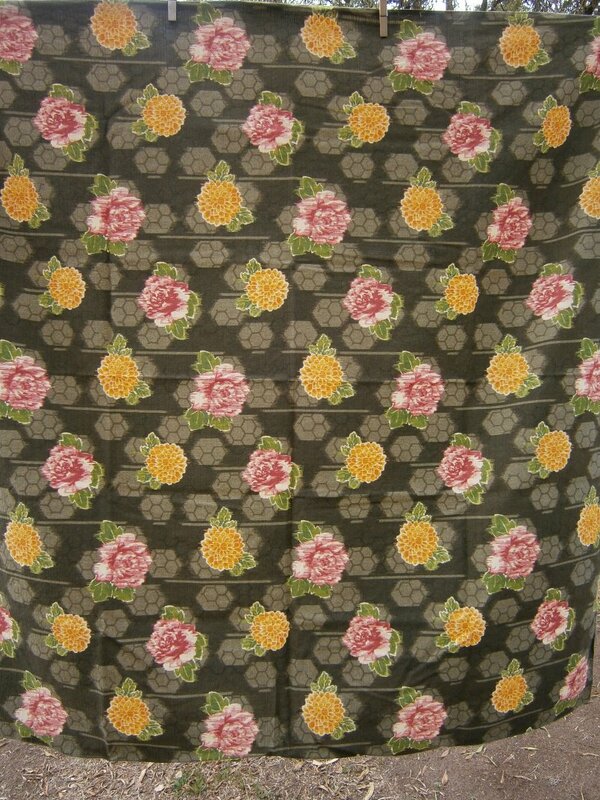 I thought this was just a pretty piece of fabric but it’s a shop-bought tablecloth with a small asian care label. Maybe someone bought it on holidays? There are no asian shops around here. It’s an old synthetic with a textured weave. And finally, a home made circular table cloth that has been washed many times. 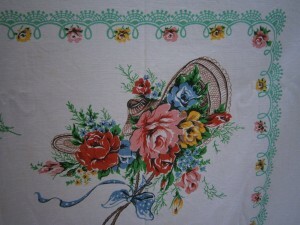 It has white, slightly frayed crocheted lace around the edges, which I have just unpicked. 1970’s or early 80’s? After discussion with my husband, it seems the Lego play mat was just a round tablecloth with no casing, loops or drawcord. When you were finished playing you simply flipped the edges in and lowered the bundle into the lego box. How simple -why did I complicate things? I spread out the round cloth and away we went! 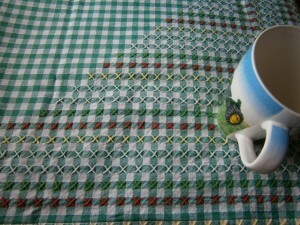 My fav was the green gingham -reminded me of long ago holidays with Grandparents. I made one of them for Sam eons ago to match his curtains and quilt cover (that I had made for when he moved from the nursery into the big boys room). So handy. Soooo long ago…..
Hi Juliet, I’m sure he’ll remember it as part of his childhood Lego playing.